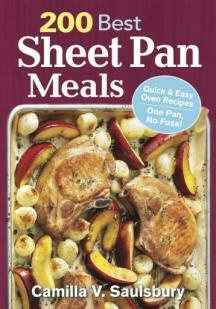 Summary: Sheet pan meals are the perfect alternative to one-pot meals. We’re all looking for ways to make meals more convenient, and while one-pot meals are wonderful, sheet pan meals are the newest option. They allow you to cook several individual components of your meal all at once, and cleanup is an absolute breeze. From cookbook author extraordinaire Camilla Saulsbury comes this collection of easy and delicious recipes created specifically for sheet pans and your oven. Similar to one-pot meals, all these meals can be cooked using ONE sheet pan in your oven. Everyone has a sheet pan right? Each recipe includes a tip that will help with the dish. There are colour photos so you can see how the dish should look. I think it’s fair to say you will find something you like in this book.